From Kara A. McLeod’s first book to her now third book, there has been such a progression from really good to phenomenal. 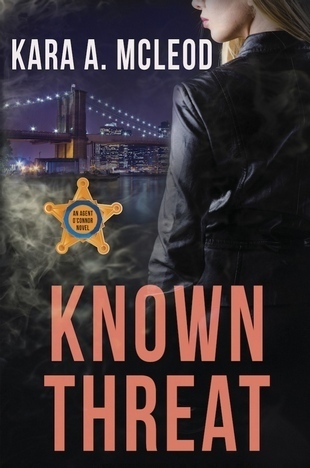 I was enthralled by the third installment of her Agent O’Connor series. She made my heart race, my emotions jump all over the place, I was taken right into the book, real life be damned. McLeod has become a master in on writing a fantastic story with main characters that exude fortitude, strength kindness and underneath it all, raw vulnerability. It hard not to be captured by this series, I can easily say this is one of the books I have been most excited about this year. Like I have said before this is a series, each book building off of each other. Do not start here, you want to pick up Actual Stop and then Worthy of Trust and Confidence. Without a doubt, this is a damn good series and you will not be disappointed have three amazing books to devour. Special Agent Ryan O’Connor returns to action after being somewhat physically and emotionally recovered from her bullet wounds. Back to active duty and dealing with the craziness that life continues to throw her way. When we ended the second book, we knew that Ryan’s girlfriend, Special Agent Allison Reynolds was having some type of an issue with her boss Beau Byers. Well, get ready for that onion to be peeled. It’s picked right off the headlines of today’s papers and it is enough to make your blood boil for both of the Agents. The Beau debacle is just one iron in the fire. Ryan has another monstrous disaster to put out. Her sister has been captured by a madman. Remember the paranoid schizophrenic from the last book who thinks the president’s daughter is his wife. Well, Adam Royce Walker is back and has taken Ryan’s sister as a way to meet up with Zoey Carmicheal. This is a heart-stopping adventure that will drag so many emotions from you. My heart broke for all the ladies involved. There are parts of this book that will crack your heart into tiny fragments. One part, in particular, will cause you true anguish. While I say this, I’m also saying its worth it because this book is so, so good. You are there every moment, McLeod transports you into the story and never takes you out of it until the very last page is turned. The book will stick with you and have you impatiently waiting to meet up with these characters again. This one surpasses the first and the second in the series. Not an easy feat to do. The best of the series so far! I cannot wait for the next one. Kara A. McLeod, you have stolen my heart with this series. If you read this review, thank you!